Today Barack Obama will be sworn in as the 44th president of the United States. It certainly didn't escape Stephen Totilo's notice who's created quite an ode to the event. Using Fallout 3, Totilo wandered around the bomb-blasted, irradiated and devastated Washington D.C. to try and capture, in-game, some of what you'll be seeing today on television if you watch the inauguration. His photo tour of Fallour 3's D.C. starts out with a glimpse of the National Mall as viewed from the top of the crumbling Washington Monument. It ends with a glimpse from the ground of the mall looking up at the Washington Monument. It's an interesting use of gaming to try and reflect on the day's news and makes me wonder why more developers don't get involved. 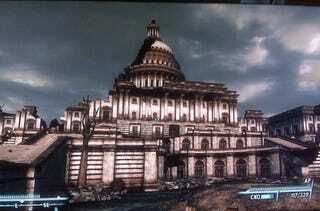 I suppose it might not be taken the right way if Bethesda released an Obama patch for Fallout 3 today.